The demand for e-commerce websites is growing massively as online shopping isn’t just a buzzword anymore, and the cart checkout process is at the heart of it. With the introduction of the latest technologies, it’s quite easy to create the perfect shopping cart checkout system for specified users. On e-commerce sites, the customers review the products before adding them into their e-carts, one by one, and then go on to billing. E-commerce websites without a functioning shopping cart system are a virtual concept. 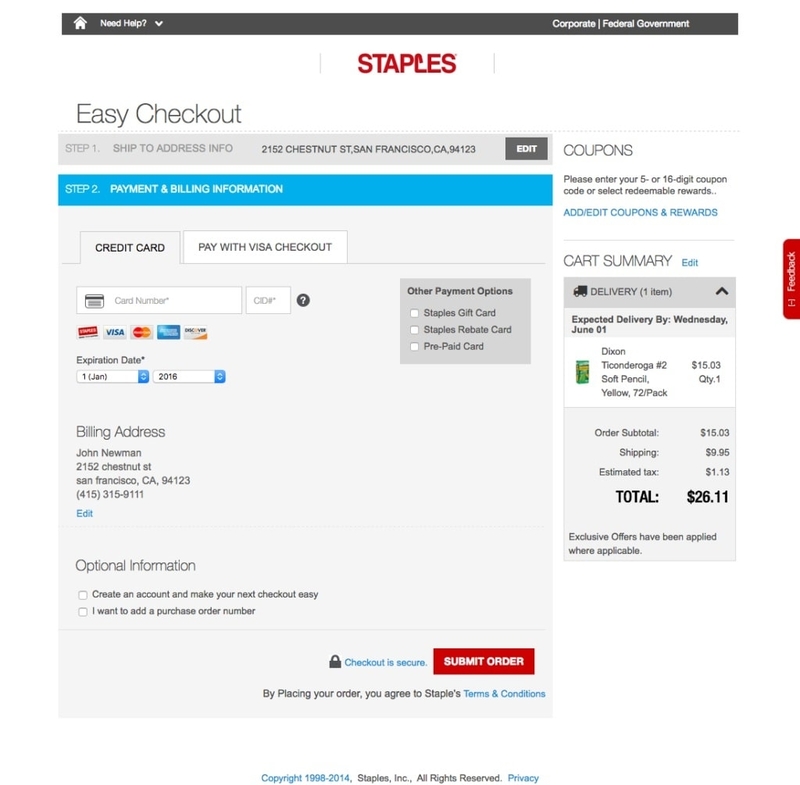 So, how do you create the perfect shopping cart checkout? Let’s dig a bit deeper. The shopping cart checkout is the process that a customer or any user must go through when checking out the items in their cart. Once he completes the assessment of his cart, he is ready to order his products. This is what a user sees in the frontend. For all those who are new to the shopping cart concept, I firmly suggest they follow ecommerce-platforms and get ideas on how the best shopping cart checkouts are being created. The most obvious and necessary part of this checkout page is to let your users know what they are going to order so that they can sense the transparency that helps build mutual trust. One good way of implementing this technique is to provide all the necessary details to allow users to know exactly what to expect when they unpack their shipped parcel. Yes. I'm talking about order reviews just before the completion of the checkout process. Here is a fine example of the order review system from Baymard institute. The chief objective of the study was to find out what the best checkout steps are, as suggested by the e-commerce checkout research study applied to about 50 e-commerce websites. The combination of green and red pointers show the do's and don'ts of a standard ecommerce checkout page. Adding other things that make them more distinct, like shipping fees, discounts, coupons, gift cards, taxes, and the total amount. Several reports show that launching a live chat feature on website boosts conversion rate and even increases sales significantly. Imagine how impressive it would look if they got to know all the information related to the products in real-time, without wasting time online by seeking it on other websites. This would not only keep them updated about their product but would also build mutual trust between customers and website owners. They would be getting real-time updates about their products and also FAQs. 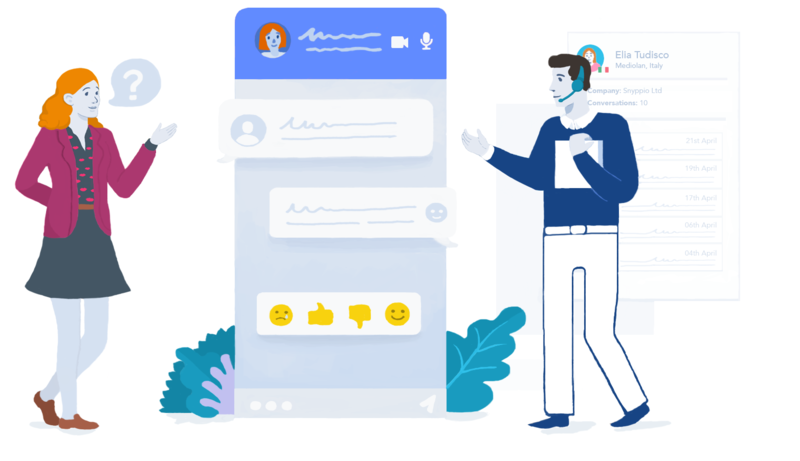 Live chat makes the customer experience better and customers’ queries can be solved instantly with the help of live chat tool. Ensuring security and trust with customers and building the relationship. There is a possibility that your E-commerce website is responsive but is your checkout page optimized for mobile users? The number of people than before are browsing and shopping from their mobile devices. So it is necessary that you make checkout pages mobile friendly so the customers can place an order hassle free. 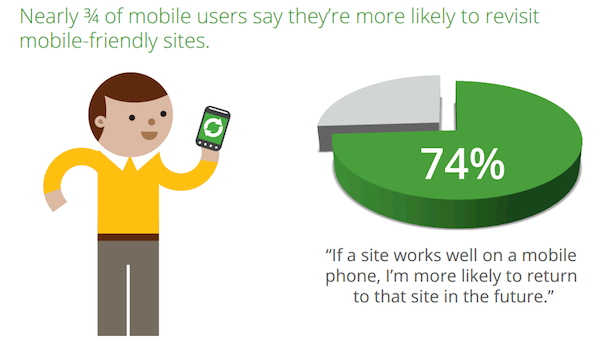 Stats show that 74% mobile users are more likely to revisit your site in future if your site works well on mobile phone. Below are some issues which customers are facing due to non-mobile friendly sites. Text appears on mobile are very small that it is difficult to read without pinching to zoom. Moreover, the product images are very small that make it difficult for customers to see. If the customer adds the item to the shopping cart again it becomes difficult to see total cost and other information. Cart abandonment ratio increases because of all above factors. Mobile optimization for checkout page is must to improve sales and conversion rates. While checking out, many users opt out because they don’t want to share any extra details about themselves with a website owner, which could scratch their privacy. Thus, it is always good to ask relevant questions. Always try to group together relevant questions relating to the product or relating to the amount payable, so that they feel secure answering them. 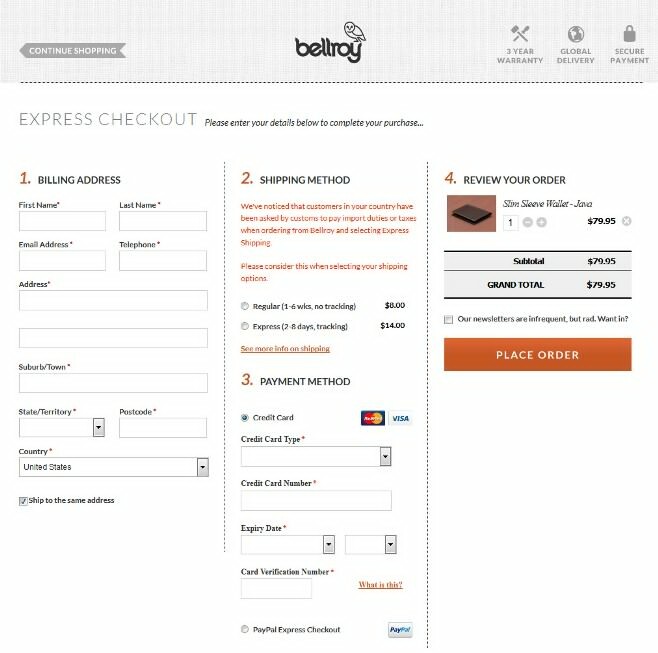 The Bellroy e-commerce store checkout page is one of the best examples here. Their approach is minimalistic. They just ask their users to provide their payment details and delivery address to complete a checkout process. The information can be entered on a single page and this process kills the need for multiple web pages for checkout. A shopping cart checkout will look impressive only when you format the details in a way that is easily read by a user. The content of the checkout page should be written in such a way that it doesn’t appear confusing to the customers. So, if you use a Readable Table-based Layout in your shopping cart checkout page, then customers will be able to see their product details clearly, like size, color, price, description, and reviews. E-commerce website designing services, like Webdesignerdepot, are going with both above-the-fold and on the page carts to add a strong flow in the cart checkout process. The description should be precise and to the point. Do you know about the minimalistic approach? Notably, too much information can kill the buying experience as users always look for a decluttered way to buy things online. The main problem is getting all the details to the customer when they are checking out a specific product. It is always beneficial and advised to remove any field that is not relevant. Size, color, or any other information about the product. By creating payment process page user-friendly and simple will help in increasing sales and conversions. Your checkout page is the final stop for customers on your website. Some points need to keep in mind while designing payment page. Allow customers to pay by offering a different number of payment methods. Even allow them to pay from their digital wallets. There are websites that offer only one mode of payment. These results in cart abandonment. Data shows that 56% of customers expect a variety of payment options on the checkout page. Many websites ask customers to sign up before completing a purchase. This will create a negative impact and many customers leave the website before checkout. 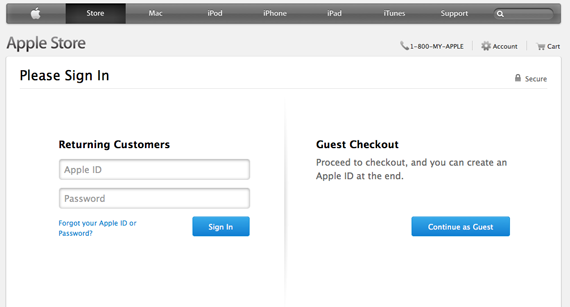 Websites like apple allow guest login so this will boost the conversion rates and even will make the process smooth. If u desire to take details of the customers you can ask the customers to sign up once he/she completes the checkout process by offering free shipping or some discounts on next purchase. Instead of forcing customers to give details at the beginning, give them the option at the end of checkout process. Do not ask for unnecessary details from customers as this may affect conversion rates. Do not create hurdles for customers by adding a long list of fields to fill out. Typing information in form fields is a boring part of online shopping. So we should try to minimize the amount of typing required. Design a page that automatically detects the city/state or region based on zip code entered by the user. This will make the process fast and even reduces typing by 40% for a shipping address. It takes a lot of time and effort in this competitive world to get customers and to convince them to trust your websites and your products. To increase conversion rates and sales it’s essential that consumers feel safe and secure while entering their credit card details on your website. There are different ways to make your website more trustworthy and convince the customer to shop online. Use of security logos and trustmarks- Use of trustmarks reassures customers that they can enter their credit card details and can shop online on your website with confidence. These logos shown above indicate technical security of the site. The above-trusted brands can help you in gaining customer’s trust and credibility. Social proof – Google’s Trusted Stores scheme provide average user ratings and recommend customers to buy that product as people have bought it before from that site. This helps to show that customers can share their confidential details and can place an order online. Social proof helps in increasing buying confidence among consumers. Contact Details – Contact options on websites make the customer more comfortable and confident that if there is any problem with their order they can get in touch easily. Building trust requires a lot of hard work but losing it is very easy. Commitment to give great customer service helps in developing trust with your customers. These are some of the proven ways by which you can create a shopping cart checkout system on your e-commerce website. A smooth checkout flow can increase profits for your online business and can improve cart abandonment rates. I admit, there are other ways, too. But, it's a guarantee that these steps will help you stay on the right track. So, what's your take?